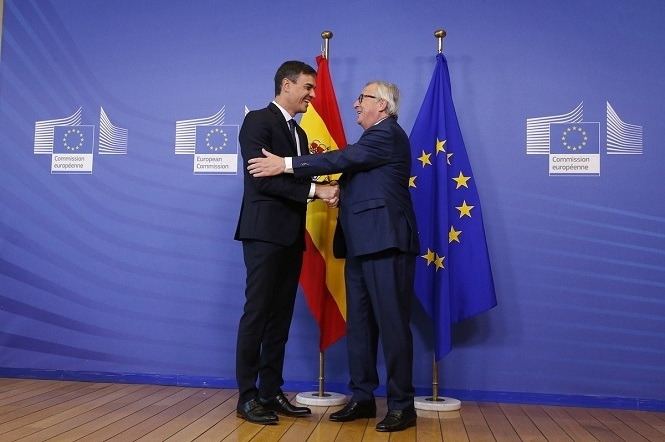 SPAIN’S Prime Minister has said unilateralism and negative language would not solve the migration crisis as he gathered with fellow European Union leaders for a summit on the subject. Pedro Sanchez added in a joint interview with British, French and German media that a shared response was needed to deal with the issue. His comments come as he prepares to sit across the table from EU heads of government who share a variety of opinions on how to go forward on migration. They also follow Spain’s recent decision to accept the Aquarius boat and one other carrying 630 people rescued from the Mediterranean after it was turned away by Italy and Malta. “I think the Italian government needs to reflect on whether unilateralism is an effective response to a global challenge such as migrant,” Sanchez told reporters. He added he was in favour of cooperating with the government of Libya to ensure their borders were functioning properly. “As effective as the inflammatory rhetoric from some Italian leaders may be in electoral terms, from the point of view of responding effectively to a humanitarian crisis like the one we’re seeing in the Mediterranean and on the Italian coast, it’s not the answer,” he said. That comment has been interpreted as a reference to Italian Deputy Prime Minister and Interior Minister Matteo Salvini. The leader of the far-right Lega Nord, appointed following recent elections, said migrants were a cargo of “human flesh” and those on the Aquarius would only see Italy “on a postcard”. Sanchez added him and French President Emmanuel Macron had discussed plans to designate safe ports in the Mediterranean. Migrants could be received and recorded there in partnership with the United Nations’ refugee agency (UNHCR). “I think the fundamental philosophy should be that when a small boat arrives on the shores of Tarifa, or Malta, or Lesbos, it’s arriving in Europe. It’s not arriving Spain or Malta or Greece,” he said. “The fundamental point is that you can’t have a national or unilateral perspective when it comes to a shared challenge. I’m called for a shared response to a shared challenge,” he added. Leaders at the Brussels summit are expected to discuss plans to place screening centres in North Africa so as to avoid them having to cross the Mediterranean to reach Europe.